Sked Mobile is a stand-alone native app for Android phones/devices. 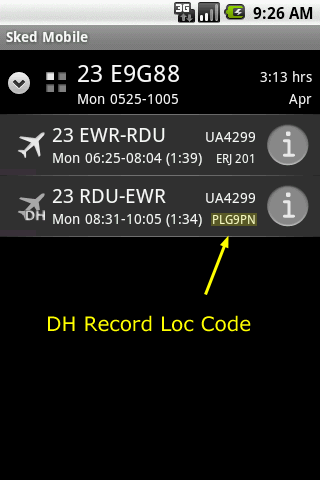 Along with downloading your Sked+ flight-schedule, it also displays layover info, flight-status and TAF/METAR weather forecast. ❶ Sked Mobile on your Android phone. Before downloading the app, you first have to enable your Android phone to download apps from non-market sites. Go to Settings»Applications menu and enable this feature. Then, using your Android phone's browser, visit this current page (i.e. www.crewapps.com/skedmobile). ❶ Start the Sked Mobile app on the phone. ❷ Press the menu button, select the Settings option. Enter your Sked+ (7-digit username) and password in the respective fields. ❸ Press the Back button to save changes and to put you back on the main app window. ❶ On the Android phone, start the Sked Mobile app. ❷ Press the menu button and select the Download option. You should see a Download Started message. After sometime you'll get a notification when the schedule is ready  tap on the notification to save the schedule to the app. My phone doesn't allow app downloads from non-market sites. Now what? You can download an app from the market named appInstaller. Download Sked Mobile (.apk file) to your desktop, then using USB cable to your phone and then run appInstaller to install. After software upgrade, on clicking the app icon, I get app not found? Please uninstall and then re-install app. Can I view my DH record-location-number? Yes with v2.5+, if it's available on Sked+, it'll be displayed. On download initiation, your username and passwords are transmitted to crewapps.com (encrypted) and then forwarded to ourasa.com server (secure). The information is not saved on crewapps.com. As always, your active work schedule is on Sked+ and it's your responsibility to check with it. Sked Mobile is not responsible for any missed assignments.